Publishers and brands, it’s time to delete your Facebook account. That is what the majority of commentators would have you believe after Facebook’s big announcement about changes to how it prioritizes newsfeed content. Although similar revelations concerning the content of brands, publishers and other organizations have become a regular concern, especially in recent months, this particular announcement seems to have shaken digital strategists more than usual. My advice? Don’t freak out just yet. Facebook constantly adjusts its algorithm to please its users and shareholders, and that balance is a challenge to keep. Organic reach for most pages generally has declined over the past year, but adjusting strategies to fit better within the ever-changing environment can negate some of those changes. One of our clients saw a 28 percent increase in organic reach over the past six months compared with the previous six months because of improved strategy and better tactics. The latest newsfeed changes also are not all about user experience for Facebook, despite the company’s noble claims. While real estate in the newsfeed becomes more scarce, Facebook is encouraging brands to view the network as a more traditional paid platform. As a for-profit company, creating more demand for revenue-generating products is a sound business move. This week’s “bombshell” seems tailored particularly well to hit back on many of the negative stories about Facebook in recent weeks. The sensational headlines include “Former Facebook Exec Says Social Media is Ripping Apart Society” and “Facebook’s first president, on Facebook: ‘God only knows what it’s doing to our children’s brains’“. 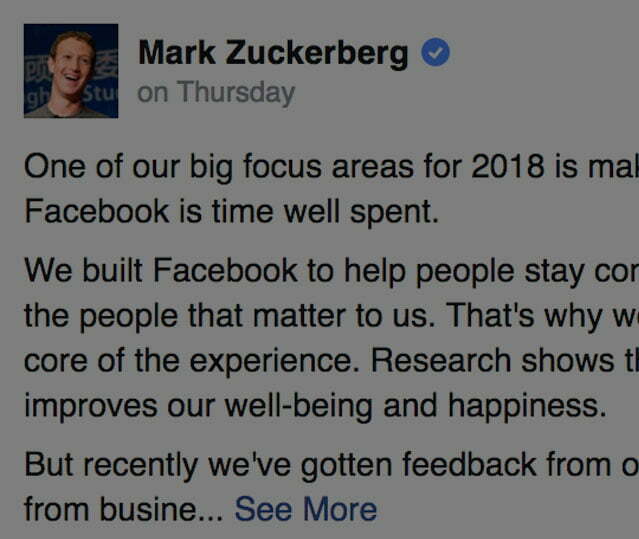 Facebook founder Mark Zuckerberg’s explanation for the change attempts to drive home the point that he wants to ensure “the time we all spend on Facebook is time well spent;” a phrase that bookends his post. He also cites research about how Facebook and the social interaction it fosters contribute to overall health and wellness. He and his company are reacting to critics attempting to vilify the platform. The new newsfeed will not be a Facebook obituary for brands and publishers. Only time and analytics will tell what algorithm changes will be made and how they will affect brands and publishers. I suspect it will be more challenging to reach audiences in the newsfeed, but those hurdles will not be insurmountable. As a Facebook user since the beginning, I’ve come to know the only constant in Facebook is change, and those who can adapt quickly will continue to thrive.